In 1946, Frederick Copleston, a Jesuit priest famous for his work on the history of philosophy, wrote a book about Arthur Schopenhauer. He subtitled it ‘Philosopher of Pessimism’. The title was appropriate. Schopenhauer was a profoundly pessimistic man. Even the philosopher-broadcaster Bryan Magee, who is a staunch defender and advocate of Schopenhauer’s work, concedes as much. He just thinks that it is possible to separate much of Schopenhauer’s philosophy from his pessimism. He agrees that Schopenhauer was a pessimistic man, but he thinks the majority of Schopenhauer’s philosophy has nothing to do with that attitude of pessimism. But it’s not clear if this is true. Schopenhauer was not shy about incorporating his pessimism into his philosophical work. And he did argue for his pessimism. Roughly: he argued that we ought to be pessimistic because of a mismatch between our desires and what is possible in the world. This seems to have been Copleston’s real point with the subtitle. He didn’t just think that Schopenhauer was a psychological pessimist; he thought that Schopenhauer’s entire philosophy argued for pessimistic conclusions. In a recent post, I noted that I think of myself as a pessimistic person (about certain things) and I believe this attitude of pessimism to be epistemically warranted. Nevertheless, I considered an argument for thinking that I should be more irrationally optimistic. Those who read that earlier post will know that I ultimately concluded that I probably should be more optimistic, though whether I can succeed in that aim depends on whether I can find some goal or project about which I am optimistic. I now want to consider the opposing view — the one from Schopenhauer’s philosophy. Maybe instead of being an irrational optimist I should, in fact, be a rational pessimist? And maybe there is a paradox involved in this? Maybe if I become a rational pessimist I will end up with a more sanguine outlook on life? That seems to be what happened to Schopenhauer. 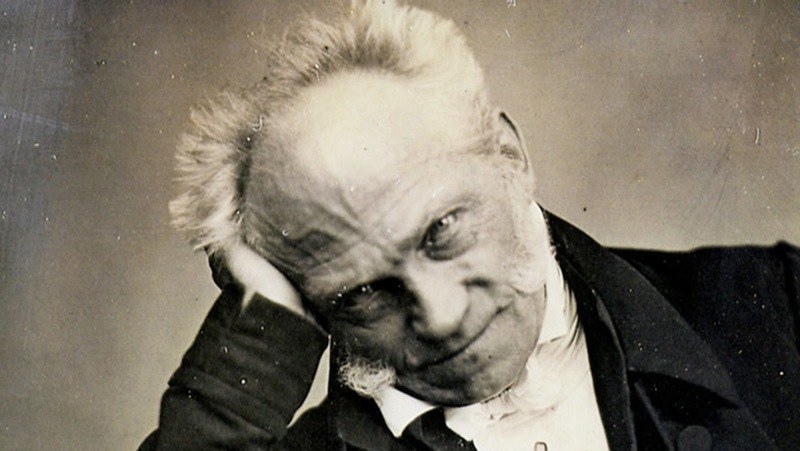 Iris Murdoch once observed that Schopenhauer seems to have been ‘merry’ about his pessimism. Maybe I can be too? And so, I embark upon another journey of self-discovery. I do so by first looking at a recent attempt by David Woods (in his publicly available PhD thesis) to reconstruct Schopenhauer’s philosophy of pessimism. I then looking at some more recent riffs on Schopenhauer’s argument. 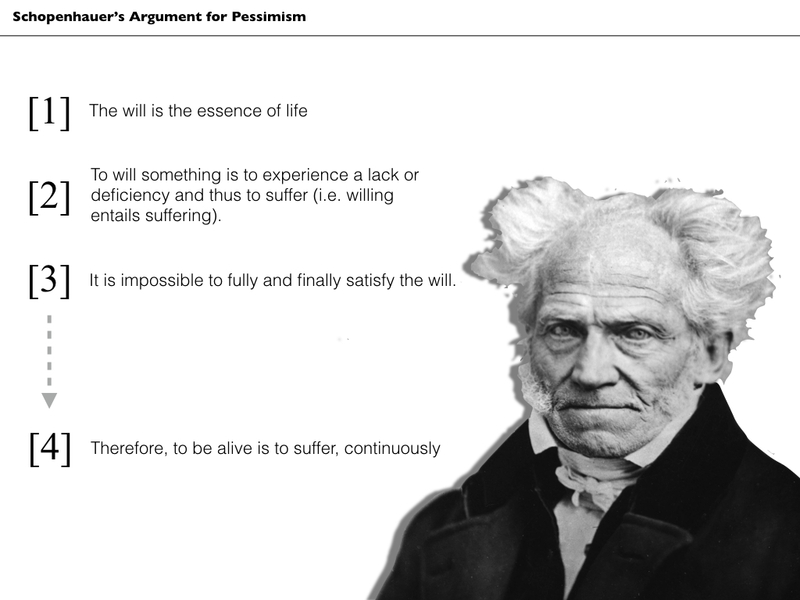 As Woods points out in his thesis, Schopenhauer’s pessimism has many sources. Contrary to the prevailing wisdom, Schopenhauer presents several different arguments for pessimism, each of which is worthy of some consideration. Nevertheless, there is one argument that represents his primary case for pessimism: the argument that willing entails suffering. I’ll be focusing on that argument in what follows. I’ll start with Woods’s version of it and then follow up by looking at a recent paper by Alexandre Billon that criticises and modifies Schopenhauer’s argument. I’ll conclude on a note of optimism. Introspect for a moment. Think about your life and your daily routines. Think about your hopes and dreams. What is the one constant across all these introspections? According to Schopenhauer the one constant is the sense of desire or, more properly, the sense of ‘will’. There are things about you and about your environment that you want to change. You feel hungry and desire food, you feel tired and desire sleep, you feel ignored and desire status. There is a gap between the world as you would like it to be and the world as it actually is. You act — through your will — to fill that gap. When you succeed you feel satisfied, maybe even happy. But then the gap opens up again and you repeat the cycle. (Schopenhauer, World as Will and Representation Vol 1, 196). (1) The will is the essence of life. (2) To will something is to experience a lack or deficiency and thus to suffer (i.e. willing entails suffering). (3) It is impossible to fully and finally satisfy the will. (4) Therefore, to be alive is to suffer, continuously. To paraphrase the famous U2 song: there is a reason why you still haven’t what you are looking for; you never will. That’s a pessimistic conclusion, if ever there was one. It’s not all that different from what one finds in Buddhism, of course, and Schopenhauer was heavily influenced by Eastern philosophies, but the reasons leading up the conclusion are slightly different and more distinctively Schopenhauerian. They are also quite controversial and in need of some explanation. I’ve already given the argument for premise (1) (introspection + observation) but what about the other two premises? What can be said in their favour? Let’s look at both in more detail. Let’s start by looking at premise (2) and the claim that willing implies suffering. Schopenhauer’s argument for this is almost logical or conceptual in nature. His claim is that if you will something (e.g. a cup of tea) it can only be because you currently experience some deficiency with respect to the object of your will (e.g. you are thirsty or in need of comfort). You are currently in a state of privation that must be rectified. This is particularly true if your will is to be motivating. You may have some vague wishes or aspirations that do not motivate you to act. This might imply that you don’t really suffer from a deficiency with respect to the objects of those wishes and aspirations. But as soon as you are motivated to act — to will something with your bodily movements — you must be experiencing some deprivation. This is a neat piece of reasoning, and probably corresponds to the phenomenology of desire in many cases. It certainly chimes with the vast majority of my experiences. If I desire food, it is because I am suffering from some degree of deprivation, however minimal it may be. That said, there are some obvious objections to this interpretation of the link between will and suffering. One obvious objection is that sometimes it seems like we can desire or will what we already have. For example, I’m currently sitting with a nice cup of tea in my hand. Ten minutes ago, I desired this cup of tea and so I got up and made it. Now I’m content. I have exactly what I wanted and, more importantly, I continue to want this state of affairs to persist. From the first person perspective it doesn’t feel like this continuing desire for tea stems from any deprivation or suffering. Schopenhauer’s answer to this apparent counterexample is to simply deny that the continued desire for the cup of tea is a genuine instance of the will at work. For Schopenhauer, the will only arises when there is some action that demands a change in an existing state of affairs (technically: Schopenhauer held that the will and bodily action were identical). You cannot, according to Schopenhauer, will a current state of affairs. It may well be that I am content drinking my cup of tea right now, but I’m looking at it in the wrong way. That’s not an example of the will in action. Ten minutes ago, when I desired the tea and got up and made it, was when the will was manifest. At that moment in time the will did imply privation. This might not be a wholly convincing response but it is worth noting that the original objection is probably somewhat academic anyway. I’d be perfectly happy to accept that I can will a current state of affairs. What I would say in response, however, is that the desire to maintain the present reality implies, at least in part, a fear of what will happen if it is not maintained (i.e. an anticipation of suffering). And, furthermore, there are still many examples in our lives when the will does arise from a feeling of deprivation and hence suffering. A better objection is that the suffering implied by the will might not be all that great. It’s probably true that when I am hungry or thirsty I am suffering to some degree. But the degree is not that severe and I am in the fortunate position where I can easily restore myself to a state of contented satiety. It’s not like my life is made completely miserable by these occasional moments of suffering, is it? Well, there are a few things to bear in mind. First of all, not everyone is so lucky and, even if it is easy for me to ‘close the gap’ between desire and reality in the case of food and hunger, there are many other scenarios in my life where the gap is much harder to close. Furthermore, and this is something David Woods emphasises in his discussion of Schopenhauer, many smallscale and trivial moments of suffering, over the course of a lifetime, add up to something pretty serious. We might overlook or ignore them at the time, but when we look back over the full sweep of our lives the accumulated instances of micro-suffering will be significant. That’s enough about premise (2). What about premise (3) and the claim that the will is never satisfied. At first glance, that seems obviously false. The will is frequently satisfied. Think back to my cup of tea. I had a desire for tea, I made the tea, my will was sated. The philosopher Ivan Soll used this kind of reasoning to dismiss Schopenhauer’s argument. In the search for full and final satisfaction, Soll seems to have taken Schopenhauer to be denying the reality of satisfaction. Woods argues extensively against this interpretation of Schopenhauer. He was not denying the reality of satisfaction. He was just arguing that all such satisfaction is fleeting and temporary. My present state of sated contentment will eventually pass and I will get thirsty again. It’s a never ending treadmill of desire. The only way to avoid suffering is to get off the treadmill and give up on desire. * But this is easier said than done because, as Schopenhauer pointed out, many people desire to have desires. This is what boredom consists of: a listless longing to find a specific desire that will capture your attention. Schopenhauer also made a deeper, philosophical argument about the relationship between the will and the feeling of contentment that comes when it was satisfied. We typically assume that we desire things because they are good for us or because they make us happy. This implies that we see the value of the object of desire as primary and the desire itself as secondary (something that derives from the object of desire). This is exactly wrong, according to Schopenhauer. It’s the desire (the will) that is more fundamental. Our desiring something is what makes us think it is good or a source of happiness. Once we attain the desired thing its goodness and happiness-inducing power dissipates. The will has to move on to something else. This is what he was getting at when he said that the ‘wish fulfilled…is a known delusion’, and it is part of the reason why it is impossible to fully and finally satisfy the will. For what it is worth, I find Schopenhauer’s claim that it is impossible to fully satisfy the will to be pretty plausible. The constant shifting and dissatisfaction of the will is manifest in my own life. Contentment and happiness are temporary at best, elusive at worst. This does, however, lead directly to probably the most pessimistic aspect of Schopenhauer’s philosophy: the negative conception of happiness. All satisfaction, or what is commonly called happiness, is really and essentially always negative only, and never positive. It is not a gratification which comes to us originally and of itself, but must always be the satisfaction of a wish. The primal state for Schopenhauer is that of willing, of desiring some change. This, as was argued above, is a state of deficiency or deprivation. When the will is satisfied we are happy and content, but this is only because we have temporarily quieted the beast. It’s not because we have entered some truly positive state of being. Think about it like this. Imagine you have a scale that measures the affective state of your life from moment to moment. We might be naturally inclined to think that this scale consists of negative affective states (states of pain, deprivation and suffering) and positive states (states of happiness, joy and fulfillment). We might also naturally think that we spend our lives bouncing back and forth from the negative to the positive ends of the scale. This is illustrated below. As natural as this thought might be, Schopenhauer argues that it is wrong. We don’t spend our lives bouncing back and forth from one end of the scale to the other. We spend most of our time in the negative end of the scale (the state of willing and desiring). We temporarily win reprieve from this by satisfying our desires and reaching the neutral point (the zero point), but we never get into the positive end. Ever. In fact, on Schopenhauer’s account, there is no positive end of the spectrum. What we call ‘happiness’ is just the neutral state. This has some profound consequences. Some people might think that whether we should be pessimistic or optimistic depends on the empirical evidence. They might be tempted to go out into the world and add up all the positive and negative states that we and others experience and then reach some determination. If the positive states outweigh the negative, then they’d say things aren’t so bad. If the negative states outweigh the positive, they might have a counsel of despair. But it all depends on the aggregative total. It’s not something that can be assessed a priori from the philosopher’s armchair. Far from being the character of a gift, human existence has entirely the character of a contracted debt. The calling in of this debt appears in the shape of the urgent needs, tormenting desires, and endless misery brought about through that existence. As a rule, the whole lifetime is used for paying off this debt, yet in this way only the interest is cleared off. Repayment of capital takes place through death. And when was this debt contracted? At the begetting. You think having to repay a mortgage is bad: try being alive. As you might have gathered, I have a lot of sympathy for Schopenhauer’s view. Perhaps it is a ‘mid-life’ thing. When you are young and on the up, you can feel enthusiastic about the challenges and opportunities that life throws your way. But when you reach the mid-point, the routine grows tedious, and you become more aware of the descent to death. You also start to see the upward cycle for the illusion that it was. You were never really on the up. You were always on the decline. There is something paradoxically joyous in this realisation. 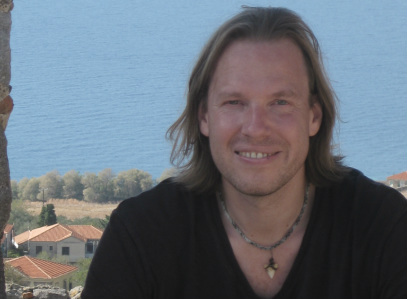 I once heard the musician and song-writer Nick Cave say that nothing made him happier than writing a sad song that captured something true about the human condition. I agree. That’s why, I think, there is an ebullient quality to Schopenhauer’s writing: he has captured something both sad and true about the human condition and he hasn’t flinched. Yet despite my sympathy for it I still think that the argument has its flaws. Let’s start with the one that I think is most obvious: the phenomenological accuracy of the negative conception of happiness. While I enjoy Schopenhauer’s interpretation of happiness, it doesn’t feel right to me. When I am in a state of elation or joy — as I sometimes am — I don’t experience this as merely the surface after being submerged in suffering. It feels genuinely positive to me — like something that adds positive value to life and doesn’t merely cancel a debt. Schopenhauer might argue that I am wrong to think about it in this way. But I think that’s a tough sell: my actual experiences of happiness have to carry some epistemic weight His negative theory makes sense within his larger philosophical scheme, but am I more certain of his theory than I am of my own feelings? I don’t think so. And it’s not just me who thinks this way. 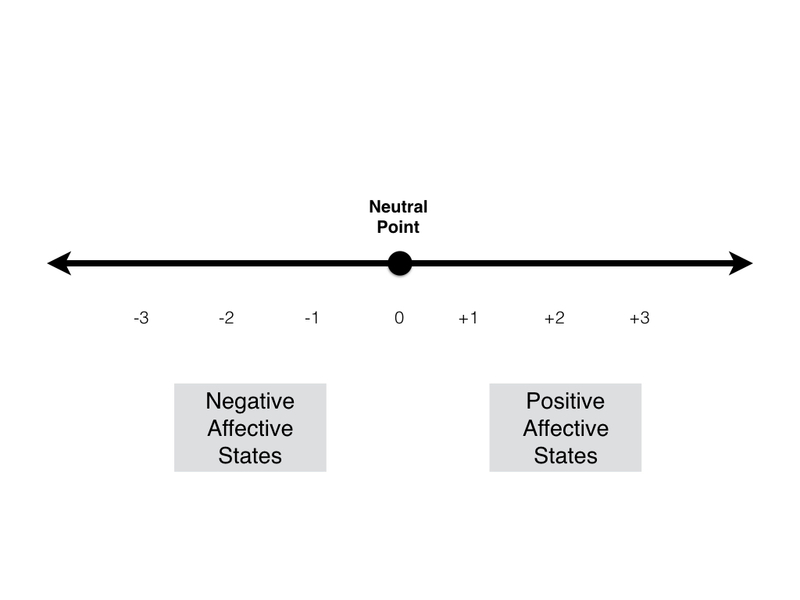 When surveyed on general life satisfaction and happiness many people self report a positive set of feelings, not a negative or merely neutral set. The negative theory might apply to some cases — particularly the feelings of satiety after satisfying some basic bodily need — but I’m not sure that it applies to all. This relates to another objection. This is one that Alexandre Billon raises in his discussion of Schopenhauer. He argues that Schopenhauer’s argument for pessimism is invalid because it assumes all happiness flows from the satisfaction of the will. But that’s obviously not the case. There are, as he puts it, ‘non-conative sources of happiness’. That is: experiences of joy that arise without any preceding desire. Things sometimes just happen to us: a friend calls by unexpectedly and makes us laugh; our partners surprise us with a gift; you hear a song you like on the radio. You weren’t in a state of deprivation prior to these things happening, but now they make you happy. These moments of unwilled happiness aren’t merely occasional; they are a frequent and dotted throughout our lives. We can have ‘eroticised’ desires: In other words, we can enjoy the anticipation of the satisfaction of desire just as much as the satisfaction. In typical Gallic style, Billon uses the example of seduction to illustrate the point. It’s often the teasing and flirting that is more pleasurable than the sexual act itself. This is true for other desires too (and may be the product of our innate biological reward system). It means that, contrary to Schopenhauer, desiring something can be a pleasure, not a pain. We can have ‘mourning’ desires: In other words, we can be quite happy and contented even though our desires remain unfulfilled and may never be fulfilled. The phenomenon of ‘hedonic adaptation’ enables this. We might lose someone or something we love and feel sad for awhile, but then recover our baseline level of happiness. What’s more, when we do this we don’t necessarily lose the desire for the thing we have lost. We may still want our deceased parents back and yet still not feel despair or unhappiness as a result. Both of these attitudes toward desire might be irrational, and Schopenhauer might argue that we shouldn’t look on our desires that way, but the reality is that we do. Irrational or not, our experience of the world is not as despairing or painful as Schopenhauer makes out. That’s at least some reason for hope. The possibility of such ‘irrational’ optimism leads Billon to develop a new and improved argument in favour of Schopenhauerian pessimism. It’s a strictly ‘rational’ form of pessimism which holds that if you are being objectively rational, then you should agree, roughly, with what Schopenhauer has to say. I can’t get into all the intricacies of his position here; I recommend reading his article if you are interested. This gist of it, however, is that a rational person will try to do their best to fulfill their desires and so if they desire anything at all they will remain, at least partly, dissatisfied (because it is irrational to hold onto a fulfilled desire). The result is that if the rational person has any desires at all, he or she is likely to be less than fully happy. That’s a somewhat pessimistic conclusion, but Billon recognises that it is not as dramatic or potent as Schopenhauer’s original conclusion. It is also an empirical claim: the degree of unhappiness depends on how many desires can be fulfilled and how much dissatisfaction they cause if they remain unfulfilled. So we can’t just be armchair pessimists. We have to get out into the world, experience it, and study it for what it is, not what our philosophical system tells us it is. So where does that leave us and where does it leave me? Ironically, it leaves me in a slightly more optimistic mood than I began. I think there is something to what Schopenhauer has to say, and I think we can underestimate the unrelenting power of the will in our lives. But I don’t think the will is always and necessarily a cause of suffering, and I don’t think the satisfaction of the will is our only source of happiness. While I suspect that I will always be somewhat gloomy in my outlook, I think reading Schopenhauer allows me to appreciate that the glass might be half full, not half empty. He would have hated that. * Another point of similarity between Schopenhauer and the Buddhists is that they both advocate similar solutions to the problem of suffering: trying to give up on the desire-satisfaction cycle and attain some state of equanimity. Though, true to form, Schopenhauer seems to have been more pessimistic about this than the average Buddhist. Your second to last paragraph has the word "LINK" instead of the link that I think you wanted to include. Good write up though. I'll have to read Woods and I've already started to read Billon's article. More inline with the article, have you had the chance to look at Julian Young's book on Schopenhauer? If you haven't, it may be of interest to you. While it is an introduction/overview of Schopenhauer's work, he also walks through and assesses Schopenhauer's arguments on a variety of topics (including Schopenhauer's arguments for pessimism).